Whether you’re moving into a new home, worried about your office security or simply wanting peace of mind after giving spare keys out to workers or guests, lock re-keying is a simple and affordable step to securing your home or business. At Jon’s Locks, we can provide reliable, fast, and affordable re-keying and other locksmith services. The majority of locks work on a simple double-pin system. 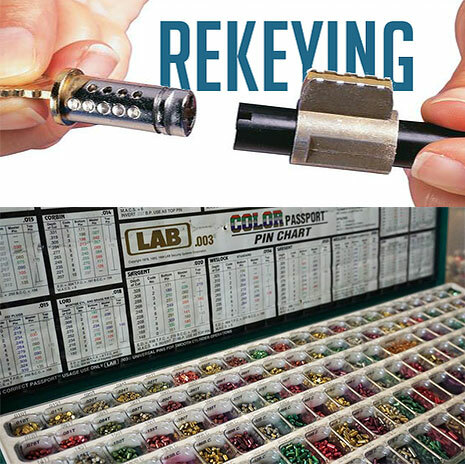 Each unique key pushes up the lower set of pins in a pre-programmed pattern that pushes the upper pins above the shear line, which allows the lock to turn freely. The wrong key keeps some or all of the upper pins below that line, which creates a barrier that doesn’t allow the lock to open. Re-keying is a fairly easy procedure in which a qualified locksmith simply accesses the lock and changes the pattern that causes each lock to open. It generally takes just a few minutes per lock, but it does require specialized knowledge to do it without damaging the lock. Another potential complication is systems that involve a master key. Master keys work on the same basic system, but each lock is programmed to accept a minimum of two keys. One is the individual key that opens that particular lock, and one is a master key that works on a similar but not identical pattern to push the upper pins above the shear line. These systems sometimes employ multiple lower pins and other mechanisms for security. They are most often seen in business settings. Master keys can also be re-keyed, but they require a well thought out plan to avoid any loss in security. Whether you need to re-key knob locks and deadbolts in your home or need to upgrade your security at an office building, choosing the right locksmith is critical. Locksmith scams have become common in recent years, which puts you at risk. Disreputable locksmiths often use artificially low prices to lure you in, then tack on high fees and other costs so the final bill is extremely high. They may also cause damage to your locks or other property. In the worst cases, disreputable locksmiths may file down pins, keep duplicate keys for themselves or other poor security measures that put you in danger of a home invasion. As a veteran-owned business, we at Jon’s Locks pride ourselves on our reputation. We are members of 1-800-Unlocks, Fair Trade Locksmith Directory, ALOA, and NASTF which ensure we meet or exceed current industry standards. Since we are locally owned and operated, we are members of the Central Rhode Island Chamber of Commerce to help support our community. Every home or business owner needs to balance budget and quality, and we stock a wide range of security products to fit every need. All of the products we work with are well-known within the industry. Whether you’re looking for new locks or simply need a re-keying, we’re particularly skilled with Schlage, Master, Arrow, Detex, Kwikset, US Lock, and BEST IC Core products. Our proprietary keyways include US Lock RXO Restricted Keyway, BEST LT10 and Schlage Everest. These high-quality products ensure top-notch security for every dollar invested by you. At Jon’s Locks, we have convenient mobile services to provide service wherever you need it. If you prefer to come to us, we have a walk-in location at 2291 W Shore Rd. Warwick, RI 02889. Just be sure to give us a call first, as our staff is often on out on mobile calls so we are often not available without an appointment. If you need to re-key home locks, get new high security locks or take care of other locksmithing needs, give us a call for fast, reliable and affordable service.